We went to New Hampshire for the weekend, home to Phillip’s brother Wayne, his wife Roseanne, and three of their 4 children with their children, etc. Plus many dogs, as you know. They have a cookout every Memorial Day weekend using a New Zealand (where Roseanne is from) cooking method called hangi. 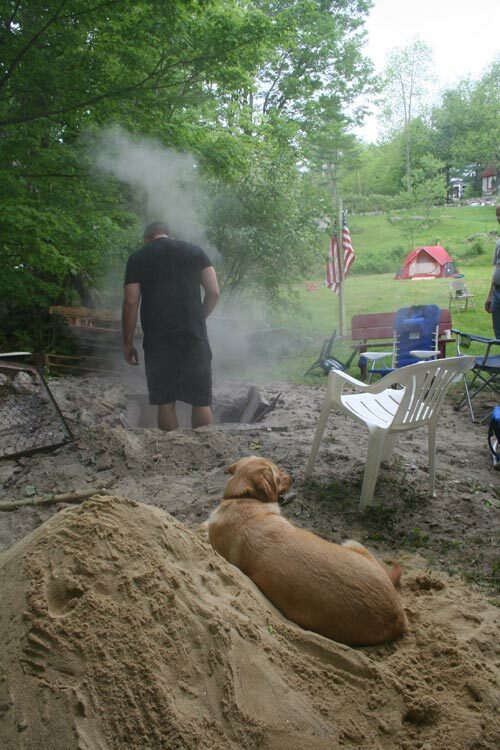 You dig a large hole in the ground, put rocks in it, build a fire to heat the rocks, put the food in on top of the rocks, cover it with dirt, then drink beer while it cooks. Yum! That’s Phillip’s nephew Jerome in the hole with his dog Elizabeth, a retriever who likes to retrieve and likes even more to jump in the icy cold river nearby. Hi, Moses! 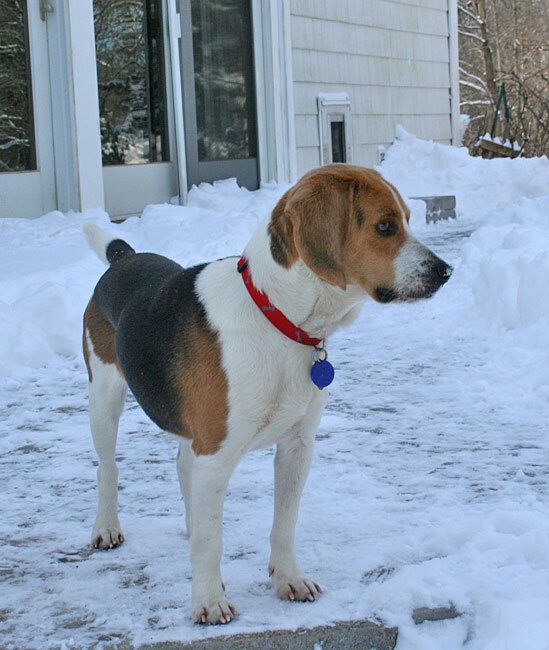 None of the dogs are beagles and all of the dogs are fine running free. The boys of course would have headed for Vermont, and thus they stayed at home with my cousin Marcy. This is Levi, one of the sweetest dogs I’ve ever known. 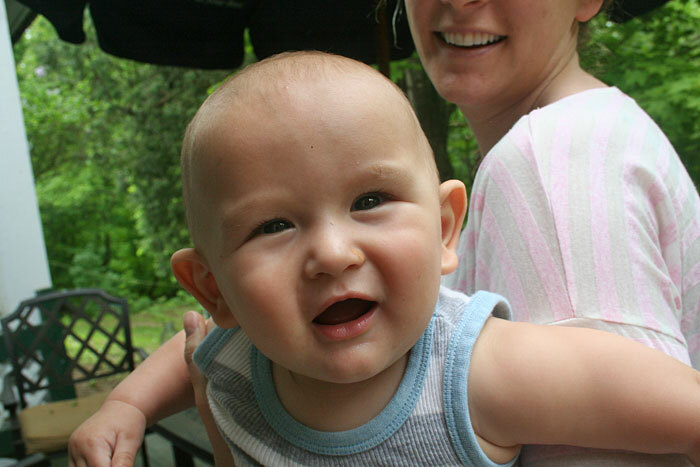 And here is baby Cole, now 7 months old! 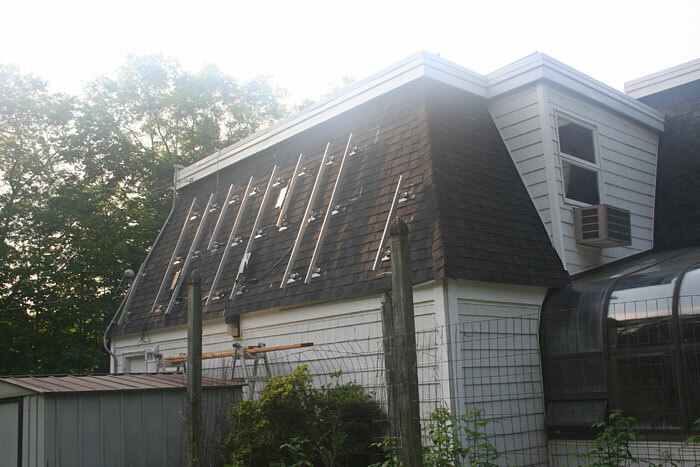 Installation of our solar panels is almost complete! Most of them are on the flat roof but we needed more so we put these on one side of the garage roof which is not visible from anywhere except the backyard. Something to look at when I mow the lawn. 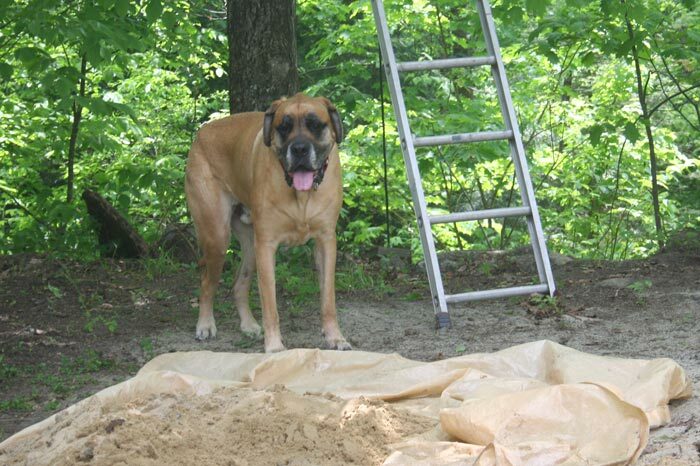 Phillip installed a temporary fence to keep the boys out of the back so the installer guys can leave a gate open. Everyone is happy. 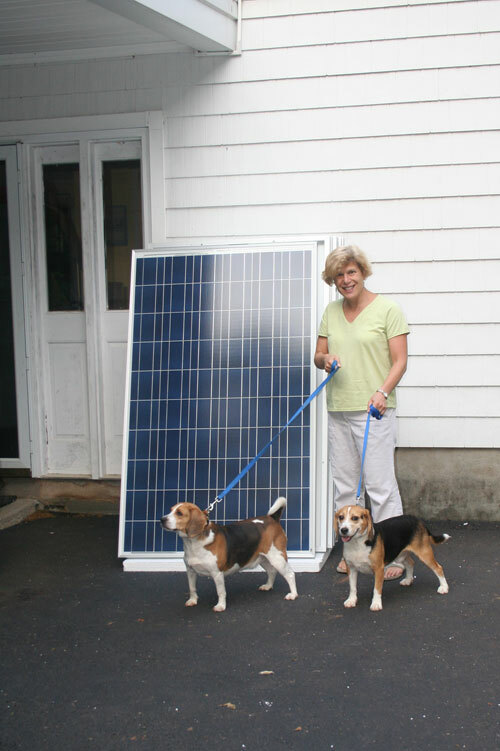 As I think I mentioned before, solar is actually profitable in New Jersey right now. The initial outlay cost is considerable but the money we’ll save plus the money we’ll earn should give us a tidy profit. No buying extra dog treats yet, though. Not until Stanley regains his girlish figure! I took Stanley to the vet on Tuesday after work for an ear infection. It started off as a wonderful vet visit, because even though I was ten minutes early there was no one else in the waiting room and they took us right away. I was anticipating at least a half hour. Anyway, the first thing of course is to step on the scale. I had already done so that morning so it was Stanley’s turn. He was 31 pounds. I was aghast. Why? Because when we adopted him in December 2009 he weighed TWENTY-ONE POUNDS! 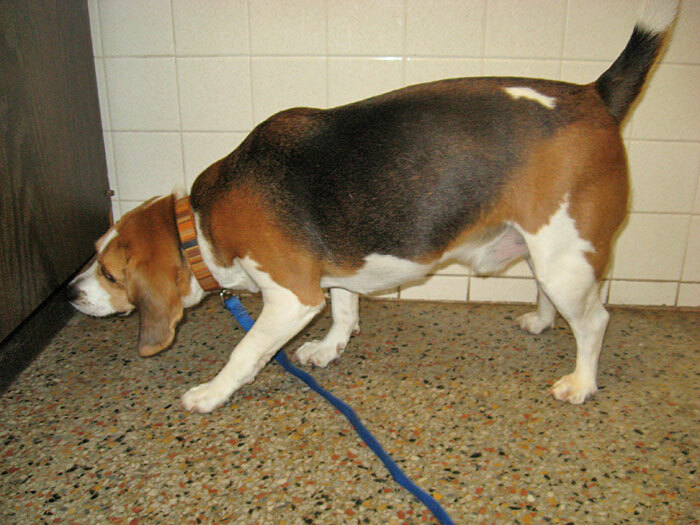 How did we let this poor dog gain TEN POUNDS? Now granted, he was rather skinny at 21, so he doesn’t have to lose 10, but he certainly has to lose 5, at least. And if Stan gained weight I’m sure that Sherman could stand to lose a pound or two as well. He is not quite as light as I remember when I pick him up. The diet starts NOW! I feel terrible about this. Sorry, Stan! 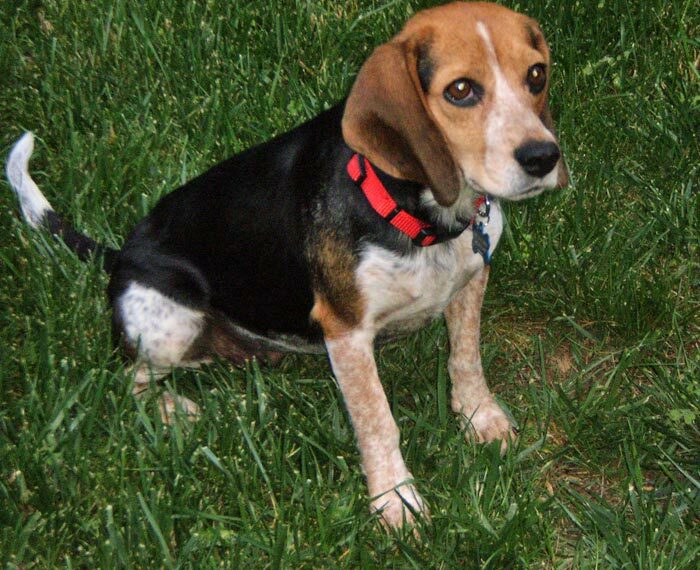 A few more shots from the beaglefest. This is Earl, whose parents are Jeff and William. I like to think of him as Sir Earl, because he is so very dignified. I forgot who this cutie pie is, can anyone help me out? 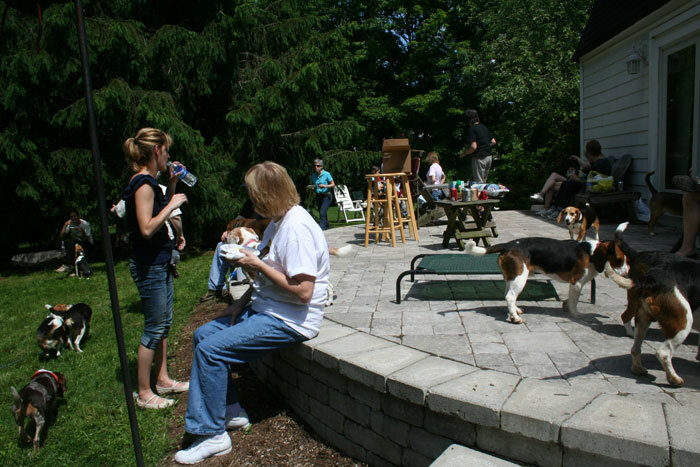 Contrary to what you might think, we did not take beaglefests into account when designing the Taj Ma Patio, but it sure came out that way! I forgot to feed the boys supper on Sunday. 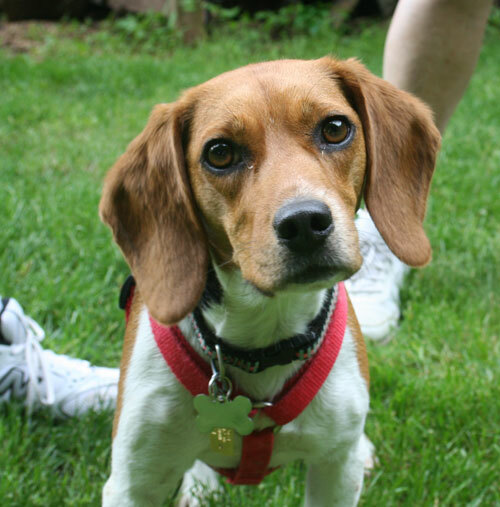 I know, I know, I could be drummed out of the beagle corps for this. But it’s not so bad as that because I eventually remembered, at about 8:30 when I was reviewing my day. I’m going to blame Phillip because he announced that he wanted to eat dinner at 5:15 due to an early meeting. So I started making the soup at 4:30 and was deep into it when my sister called at 5 (beagle supper time), and then the soup was ready and it was time (for us) to eat. And since we always eat after the boys, well…I forgot. They didn’t seem to notice. I can only imagine if I’d forgotten to feed Clayton. By 5:30 he would have been shaking, and by 8:30 he’d have been practically in convulsions. This is not to say that they weren’t happy to dine at 8:30. And I promise (PROMISE!) I’ll never let this happen again. 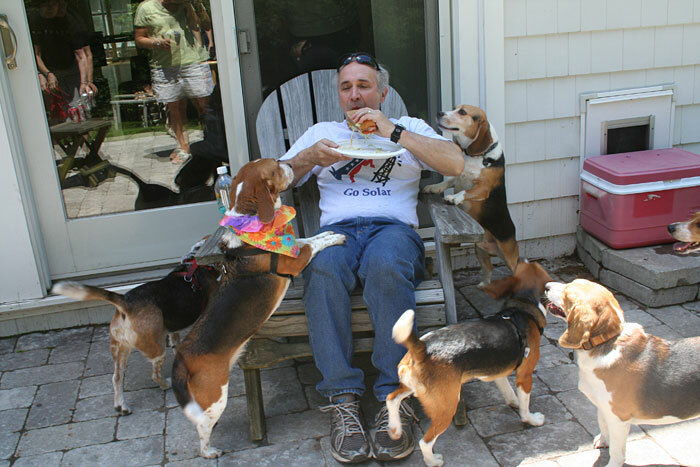 We hosted an SOS Beagle Rescue beaglefest on Saturday. Somehow we were lucky enough to enjoy the only nice weather in possibly two weeks. 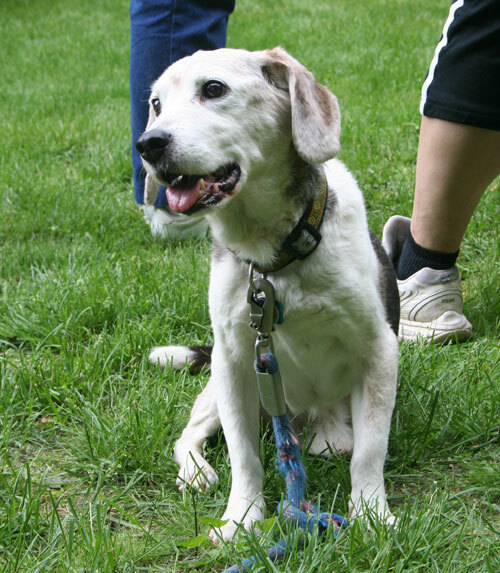 We had about 40 people and about 35 dogs, mostly beagles of course, but not all. 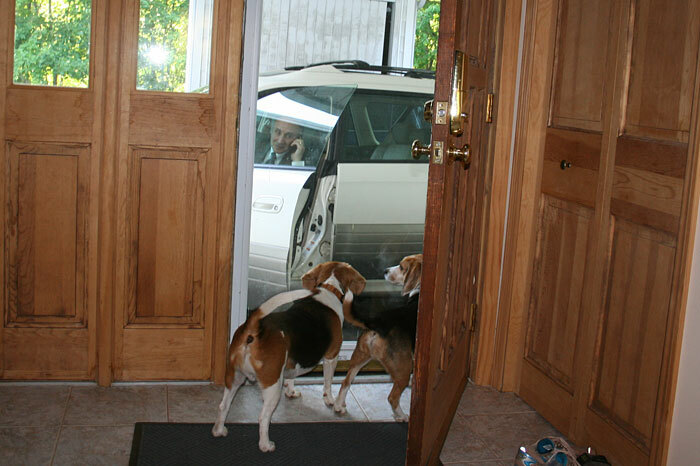 Stanley did his usual freak-out when the first few dogs arrived but then calmed down and was surprisingly polite. Sherman mingled for about ten minutes and then asked to go inside. 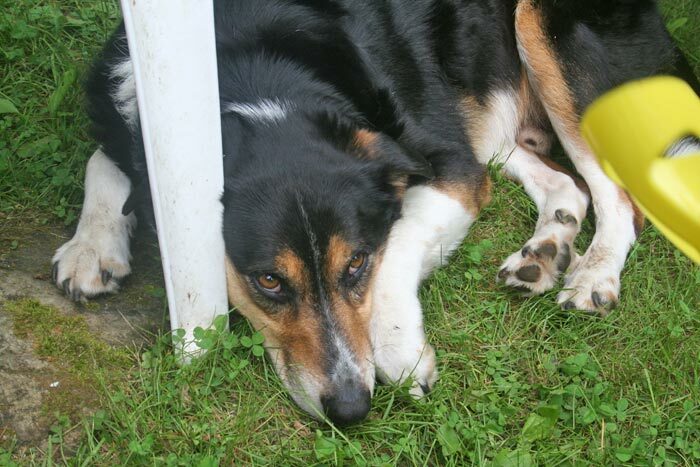 Spenser used to be like this, he hated the commotion of beaglefests and tried to go in, but because he was tall enough to reach the food, he had to stay outside. I know this is funny, huh? 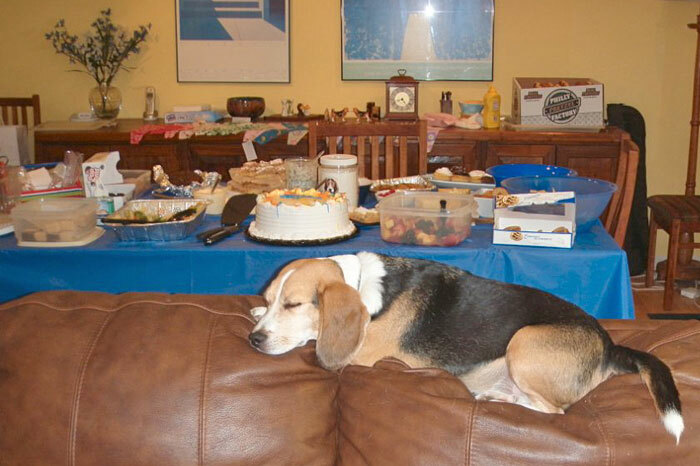 A beagle asleep next to all that food? 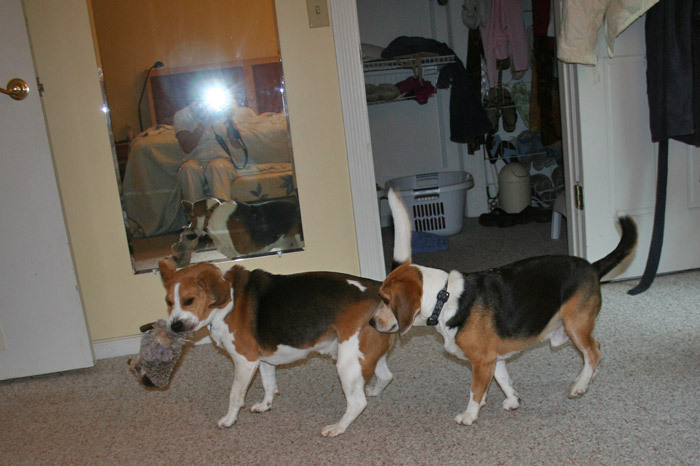 The first photo was taken by my friend Jeri, who brought her husband Toby and beagles Sammy and Millie. 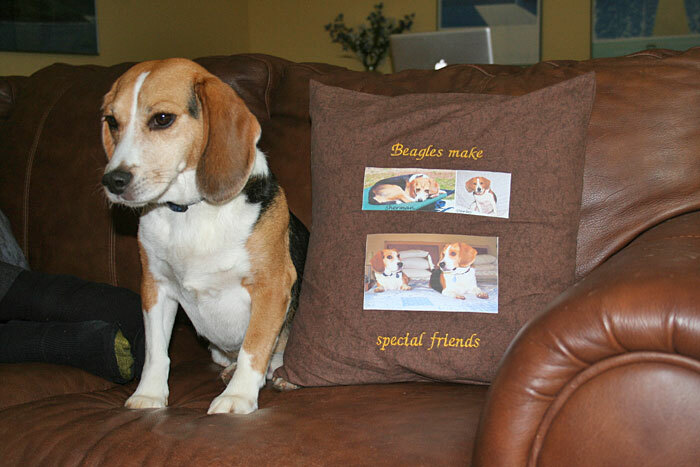 She also brought me this gorgeous pillow that she made herself. Thank-you, Jeri!! Okay, maybe Stan is just a teeny bit overweight. He gets so much exercise, though! Five mile walks on the weekends and 30-45 minute walks during the week. It’s been raining all week but yesterday Phillip was able to get in a walk on the canal between storm clouds. He’s a good daddy, huh? And he does just about all of the walks without me, I must admit. On the weekends he walks with 1-3 of his buddies, and during the week he either listens to a book on Bluetooth or talks on the phone. Oh, and that piece of whatever hanging from the refrigerator? I DIDN’T DO IT! 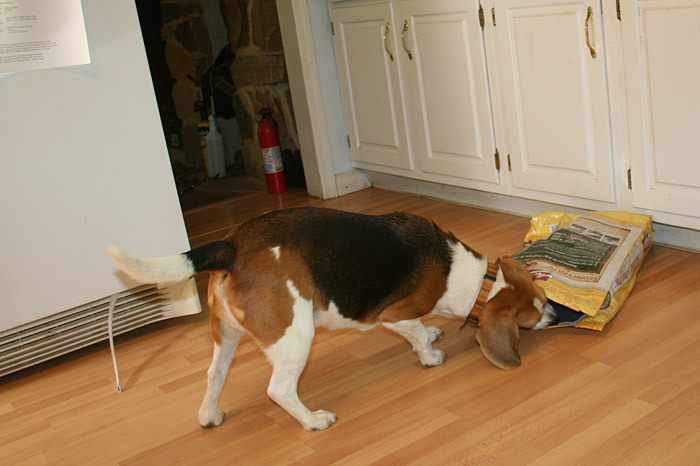 Those stuffing-less doggy toys have gotten a lot of play around here. We’re up to three now. I added a skunk which might not have been such a good idea because the other night I was in bed reading and Stanley came bounding up with Mr. Skunk in his mouth. I gasped for a second, then remembered what it was. Nothing like getting your pulse racing while you’re trying to fall asleep! So. How do I explain this? On Saturday we went to New Hope, Pennsylvania, a charming and fun town just across the river from New Jersey. In the morning we went to the gay pride parade, and in the evening to a Cheryl Wheeler concert. Both were great! 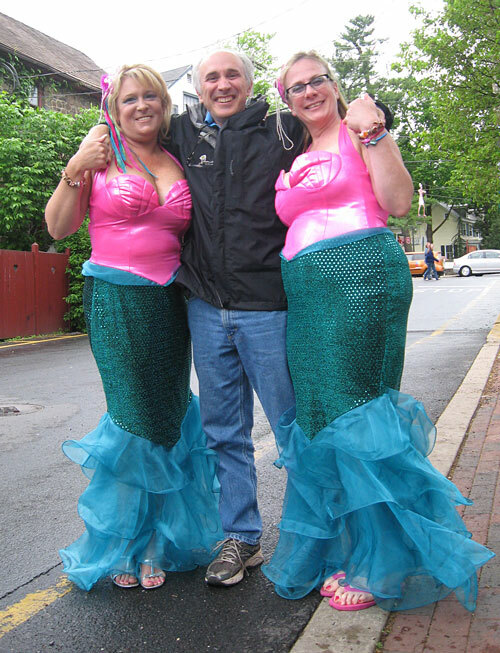 These two lovely mermaids told us that they had flown in all the way from Atlanta for the festivities. They were real troopers, spending the whole day in costume despite the weather being cool and damp. And this lovely lady is Martha’s new girl Ruby. Let’s all give a big arooo to welcome her. She’s gorgeous! Look at that ticking!